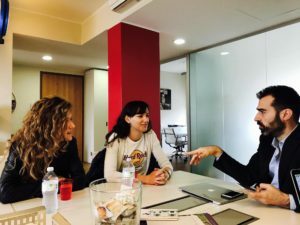 A couple of day ago we met with Jelena, one of our former students who experienced a summer internship here in Milan with our Student Value Path. She has come back to visit the friends she met while working in Milan. We took advantage of her coming in to say hello and did a short interview. She told us about her internship experience and her project with Career Paths. Where did you do your internship, for how long and for which company? I had my internship here in Milan during June and July of 2015. I worked in a company called ECPI in the index department. They provide investment and sustainability advisory services. How would you define your experience in ECPI? Certainly a formative experience. The first month was pretty challenging, because I didn’t know what to expect. My internship project was to develop a back test for the launch of a new thematic index strategy that the company managed to sell to a prestigious customer. I had a tutor, Filippo, who guided me through this path and he helped me a lot. He had the patience to explain my assignments to me and I certainly improved my skills also thanks to his presence. Do you think you have improved your existing skills and developed new capabilities? Yes. I improved my existing skills in being responsible for my assignments and in my commitment to the job itself. I also started to use software I had never used, like iBank FX Client and Bloomberg Terminal. I still use iBank, but unfortunately in Montenegro not many companies use Bloomberg Terminal, because it is very expensive. Nevertheless, if necessary, I would like to be able to work with it! I also improved my linguistic skills. Here in Milan I had to speak Italian, and definitely improved with the practice.. The company also worked in English, so I can say that now I speak it pretty well. What do you remember mostly about your Student Value Paths experience in Milan? I remember the first days of work. I was so excited but also a little bit worried! As I said, I didn’t know the company’s products, so the beginning it was difficult — but in the end wonderful across the board. I met a lot of people and I’m still in contact with some of them. I certainly remember the initial effort but also the positive environment around me. Culturally, I really enjoyed the Scala! I went to see “The Barber of Seville” with Career Paths team and I fell in love with it. I also met many new friends outside the company and other interns experiencing their Student Value Path. We enjoyed going out to do some shopping or to have dinner, and shared our day’s experiences! What are you doing now? Did the internship help you navigate the professional world? I ended my Master in International Economics at the University of Donja Gorica, and am about to start writing my final dissertation. In the meantime, I’m working at China Road and Bridge Corporation. It is a company that focuses on both the basics and on innovation. It builds highways in Montenegro (where there aren’y many) and it collaborates with other Chinese companies. I work in Accounting Management on a team made of another 3 people. I like it, because my teammates are Chinese and am learning about a different culture everyday. Also, as during my internship, I have to speak English and am always improving. My internship certainly helped me significantly to handle this new job. I learned to use software while in Milan along with gaining understanding of other general business principles. Did Career Paths support you during this journey? I really felt supported by Career Paths. In the beginning, before summer, we did the counselling process where I learned how to write a good resume and how to face job interviews. Then, they were present the whole time during my work in ECPI. I met with them at least once a week and also planned meetings during the weekend. I really enjoyed attending seminars and lectures, and also the time at Teatro la Scala. Also, thanks to Career Paths projects, I had a very interesting and complete tour of Milan and enjoyed some time out at night — having dinner together with the Career Paths team. I did have the chance to visit two other beautiful Italian cities, Rome and Venice. Absolutely yes. It’s quite formative. You become more responsible, especially if you go abroad and you have to live on your own. Then you start to experience what life is after school time, and you learn things that you are certainly going to use in you working future. So my advice is to live this experience fully, as I did, and this will definitely have a positive impact on you and on your future.